If you must know, Nicole and I kind of giggled all over Atlanta this week-end. 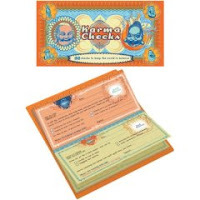 We loved the cards I mentioned yesterday and we fell on the floor laughing at these Karma Checks. Good Karma Checks are intended for acknowledging positive moments (receiving an unsolicited favor, having an excellent conversation with a stranger), while Bad Karma Checks are for admonishing bad behavior (talking loudly on a cell phone in a public place, stealing a parking spot). I so wish I had these with me all the time…and the nerve to use them!